Believe it or not, building a poorly designed landscape can cost just as much as building a well designed one. 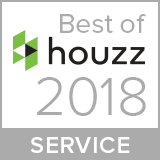 So when you’re forking over big bucks to create the outdoor living space or garden of your dreams, it pays to get the design just right. In fact, the more time you spend on the outdoor landscape design by reviewing its nuances, the more familiar you will be with the outcome. That eliminates unpleasant surprises during the chaos of construction or later on after the crew has left the yard. Where space is limited, this designer extended the edge of the too-small patio outward behind each chair location to allow them to slide back safely. Mistake #1 Spaces created are too small to use. This is a typical problem for small urban homes, condos or small country club residences where outdoor space is minimal, but it can happen in larger landscapes too. When making patios, walkways and gates, beware of undersized dimensions. 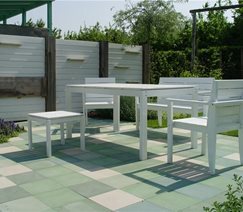 Here’s why: A patio that leaves little room to slide your chair back from the table results in a chair leg falling off the deck or slab. Servers can also suffer the same fate creating liability. That is why a 10′ by 10′ space should be considered bare minimum for a 5′ diameter table with chairs. 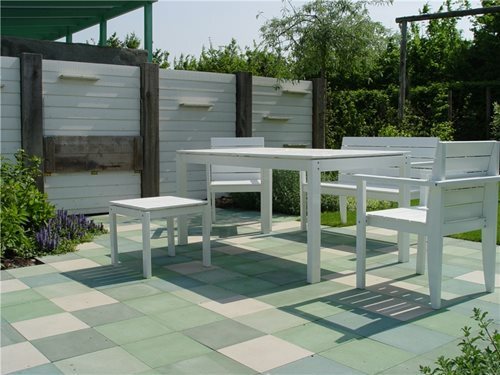 Get more information about properly sizing patios and walks with thesebackyard patio dimensions. Functional walkways must be wide enough to accommodate a wheelbarrow, lawn mower or garbage can. Though 3′ is standard, some designers narrow it to 30″ which becomes problematic. Consider 4′ wide an even better choice if possible because this also dictates the dimensions of the gate. Otherwise this bottleneck can cause you to bark your knuckles on the gate posts every time you pass through with a large item. When these doors are thrown open, the interior paving flows perfectly into the exterior patio. Mistake #2 Failure to connect indoors with outdoors.If your outdoor landscape is successfully designed to become a visual extension of adjacent rooms, the whole will seem greater than the sum of its parts. This is doubly important in smaller homes where the patio or garden is vital to utilizing every square inch of what can be very expensive real estate. Beware of a design that fails to do this in every possible way. This connection relies on carrying the colors, textures and style of your indoor spaces over the threshold to the outdoor materials choices. 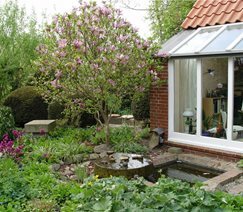 When the French doors or slider is closed, your eye should travel across the room and through the glass to the outdoors as seamlessly as possible. When the doors are thrown open you want the transition point to literally disappear. Key to this is paving materials that are nearly identical, such as travertine flooring indoors and a matching ceramic tile or imprinted, colored concrete outside. Also key is to match the decorating style to furniture, plants, exterior partitions, and decor outside. You don’t feel a design that’s piecemeal because four different types of surfacing and gravel, a combination of traditional garden and desert garden plants with potted herbs thoughtlessly in the center support no overriding style. Mistake #3 Piecemeal design.Creating a large or intricate landscape can take time and a lot of money, so many elect to build it one item at a time. The most common example is the swimming pool, a highly valued and often used amenity. The contractor comes in to design the pool within a new home yard exclusively from his or her point of view. These early decisions later become the overriding criteria for the rest of the landscape. It becomes an afterthought, and looks like it too. When you tell your designer you want “phased installation”, he or she will design your entire project up front. This way it is all visually and functionally integrated for maximum beauty and economic efficiency. You can construct any part without conflicts with the rest of the space any time in the future. If the pool goes in first, the design will tell the contractor where mechanical must be located, how safety fence works with adjacent outdoor living spaces, where surfaces should drain without damaging planting and so on. The answers are all there on the plan, so no one is making a decision arbitrarily without taking into consideration all the elements of an holistic landscape. When a plant such as this ivy is used in a small space, it will require future pruning on a regular basis to keep it attractive and in bounds. Mistake #4 Oversized plants.Planting design is all about selecting the perfect plant for every space in the landscape. That plant should fit in the space provided when it reaches maturity, which is its maximum height and diameter. This is particularly important with shrubs used in foundation planting around the house. When a plant selected grows too large for the space provided, particularly when it is in a crucial spot such as a tight entry or beneath a window, the gardener must prune it to size. This is most often done by shearing the plant into the space, which spoils its foliage, flowers, and sometimes attractive fruit. When you see homes with a lot of shearing going on, it’s because the plants have outgrown their spaces. It also tells you there’s a lot of maintenance required to keep it looking good. A good designer knows the dimensions and character of every plant he or she specifies for a project. This allows the plant to reach its ultimate size while retaining its natural beauty as envisioned on the drawing board. It does not become a box, ball or pyramid. The plant, like its siblings in the wild, grows to be relatively maintenance free, saving you labor, time and money. This very small entry yard is so well designed it offers excellent access and beautiful views year around. Mistake #5 Underestimating importance of good design.As stated above, a beautiful, well designed landscape costs the same as a poorly designed one. This difference is with the designer. Well trained landscape designers who work with a large palette of plants and materials as well as a wide range of styles are geared to give you a fine project. An installer who has little training may get the plan done, but it won’t be great and it will do even less for the beauty and enjoyment of your home. Plan to spend a bit more time to find a reputable designer. Make calls and ask for references. Talk to former clients to verify all claims. Visit those jobs if you can. For just as an architect can design an ordinary tract house or a beautifully detailed cottage, a landscape designer can create a vital and lovely outdoor living space, or just a patio and some plants for about the same price. Seeking some additional privacy from your neighbors? Want to block out some unwanted noise? There is no need to invest in an unsightly, exorbitantly costly fence. Our team can help you by planting privacy trees! Living privacy fences do not demonstrate the only benefit of these plants. They can block out unwanted neighbors while simultaneously increasing your property value and benefitting the environment! Planting living privacy screen is an excellent option to bolster privacy within your yard. You can grow either a hedge or a screen while keeping your privacy fenced with natural greenery. 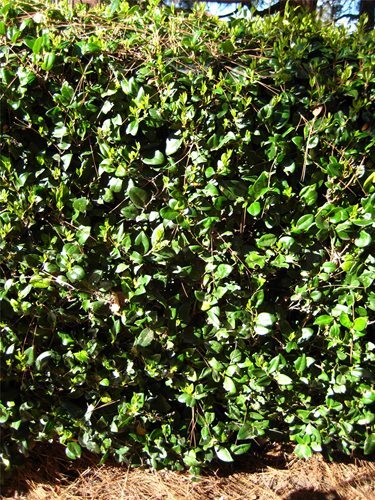 A hedge typically consists of a densely planted row of a singular shrub variety. A shrub grows quickly and also receives shearing to create a formal look. On the contrary, a screen consists of tall, narrow trees planted tightly in a row. Privet hedges adorning property lines provides a classic look. Landscape architects ideally seek privet hedges to cultivate an optimal private setting while offering a natural look. A Japanese/Texas privet is a fast-growing evergreen shrub that produces beautiful white flowers. 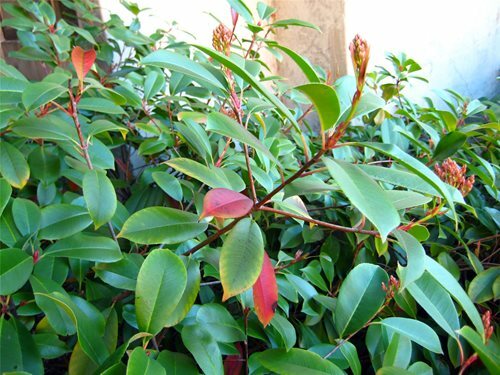 Red tip photinia is a mid-sized evergreen shrub featuring youthful red foliage during the spring. The red aesthetic of leaves is a stark contrast to the older green leaves as the plant ages. Red tip photinia produces white flowers in the spring if not pruned during the earlier seasons. A hardy, attractive plant, podocarpus is an optimal low-maintenance choice for sun or shade. A great-looking garden design regardless if pruned regularly or allowed to grow naturally. 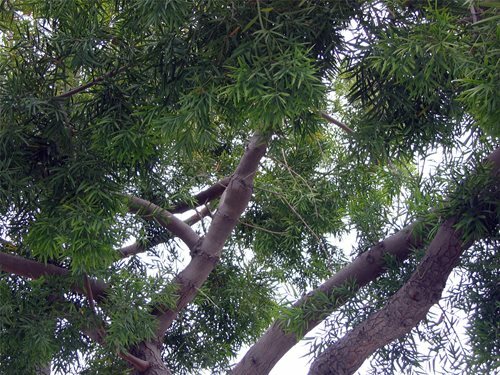 Podocarpus is a slow-growing evergreen tree producing minimal landscape debris. Juniper can range from low ground shrubberies to taller trees. Close together, juniper trees and shrubs at several feet tall can provide the perfect privacy screen while offering an elegant aesthetic. Juniper is embellished with silver-blue juniper berries harvested for gin. 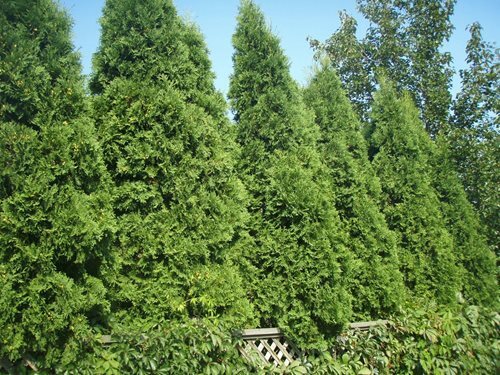 Arborvitae is a popular privacy screening greenery. 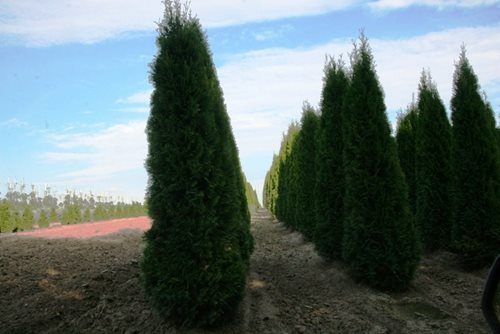 Green giant arborvitae possesses a beautiful round as well as upright shape, with a dark green hue all year long. Planted properly, arborvitae growing provides a solid privacy barrier that is low maintenance, as well as long-living. 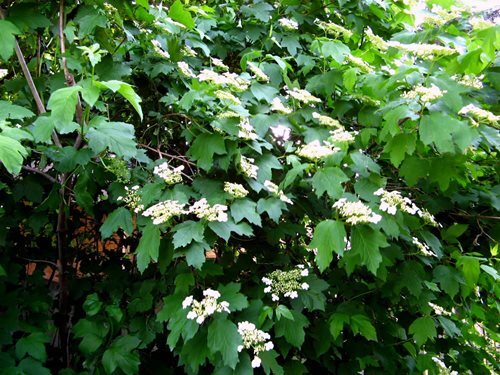 Viburnum is a sturdy shrub for hedges as well as privacy landscaping plants screens. Traveling through South Florida, you can see Viburnum virtually anywhere. The plant sprouts white blossoms in the spring accompanied by a sweet scent. 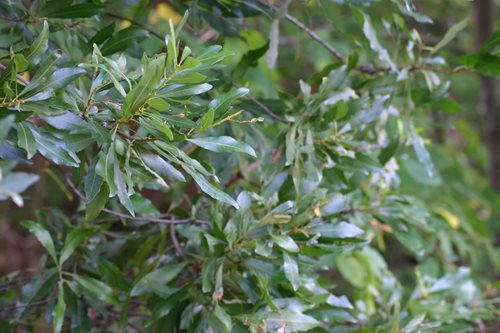 Wax myrtle is a fast-growing plant native to South Florida. The plant is very resilient to hot, cold, wet, as wel as even salty conditions. 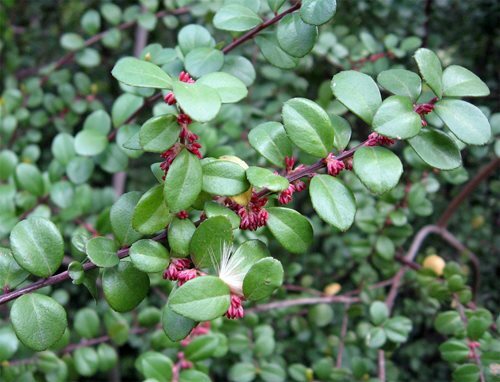 You can groom the foliage to create an elegant, formal look, or let the plant grow into an upright bush. 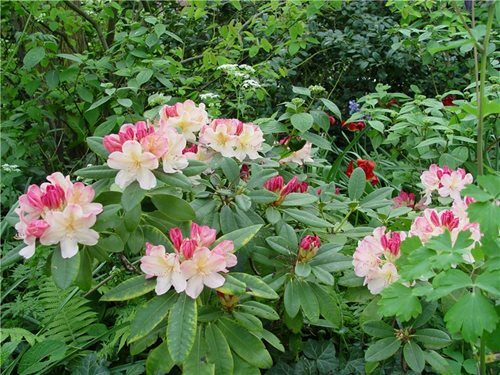 Rhododendrons provide one of the best living sound barriers. Their dense evergreen leaves reflect noise pollution. There are no other species as effective at maintaining privacy in addition to minimalizing noise pollution. 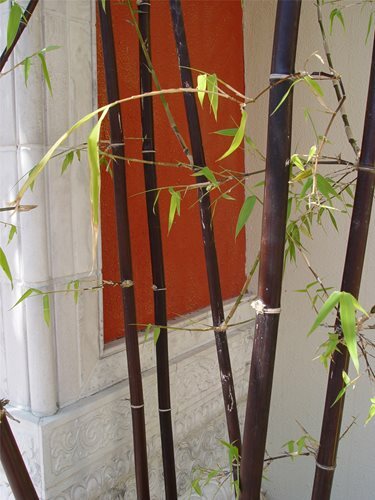 A bamboo privacy screen provides beautiful evergreen foliage as well as old world style elegance. 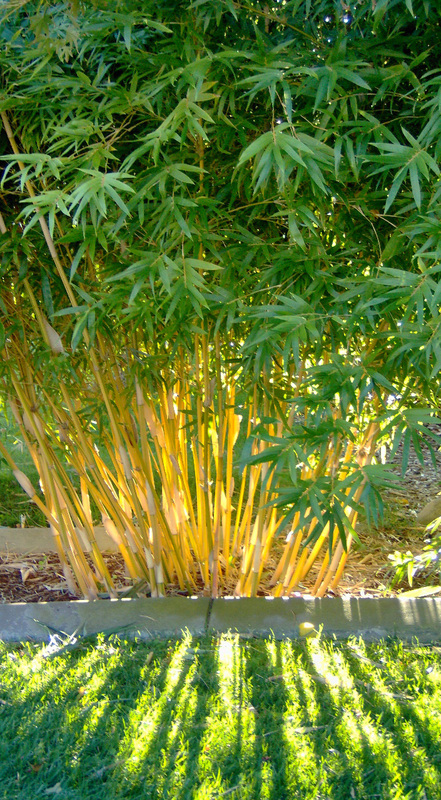 Bamboo can be temperamental about growing conditions such as sunlight exposure, cold weather, heart, in addition to humidity tolerance. Nevertheless, bamboo provides a preeminent option for both aesthetics and privacy. African boxwood is a rugged plan ideally suited in hot or sunny locations. Fresh growth emerges with a red tinge, changing into a deep green as it matures. African boxwood exists in male, as well as female forms. The female plant produces purple berries. When you decide on a plant for privacy, it is important to understand the characteristics you need for your space or purpose. You can determine the best-suited plants for your property utilizing this knowledge. As a result, your landscape can boast an optimal privacy landscaping plants screen. If you plan on growing your privacy landscaping plants screen in a narrow area, opt for a columnar variety. If you possess a spacious, expansive plot of land, you can additionally employ pyramidal varieties. There are numerous plant varieties available to create the best possible privacy hedge while you increase your enjoyment concerning your green expanse. 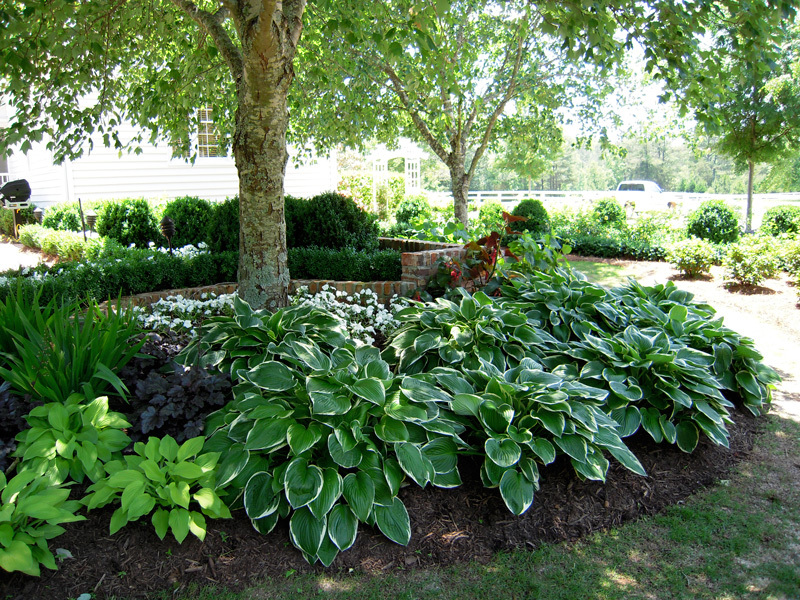 The types of privacy landscaping plants are extraordinarily diverse from strain to strain. However, with our assistance, you can find the ideal solution for your unique property while meeting your needs. For more information on privacy landscaping plants, in addition to different hedge types, contact Blaum Landscaping. Our team is dedicated to landscape design while helping our clients achieve the optimal privacy level they desire. We can create a unique solution involving elegant greenery to provide your lawn with a beautiful aesthetic. This involves ensuring our team meets every expectation and design features such as an eating or sitting area secluded in your property’s natural aesthetic. In addition to being beautiful, our privacy landscaping plants ensure that your intended seclusion remains intact. Shade grows moss, it makes a yard cold and dreary, darkens interior rooms and omits sun loving flowers. Finding Shady Yard Solutions Miami an existing shade condition is not easy, and options are few. But there are ways you and your designer can use plants to make shady conditions far more appealing. Technique #2: Create the Illusion of Sun Dappling – Includes a list of the top variegated shade plants. Technique #3: Shady Shrubs for North Foundations – Includes a list of the top shade-loving shrubs. Technique #4: Add Excitement to Shade with Perennials – Includes a list of the top perennials for shade. LIGHT SHADE A few hours of direct sun each day. Many plants grow here. MEDIUM SHADE Little direct sunlight. A few plants grow here. DEEP SHADE No direct sunlight. No plants grow here.